I did my best Lucille Ball impression on Sunday -- it's not a big comedic stretch for me. It's more like life or me just being me. Let's see, Ryan's called me "Hurricane Susie" ever since I made him dinner once and got spaghetti sauce on the ceiling. Actually, it was all over the ceiling and the walls and the floor and me. And Nan's called me Missy for years, because only a Missy could shatter a chandelier with her hands while telling a story or leave a refigerator door open in a garage during a 100 degree summer day. Oh and then there's my immediate family. Well, they've learned tricks to avoid my inevitable calamity. Mom never puts anything on the edge of a counter, Eric doesn't stand near me and a counter, and Shelley, well, she can actually be an accomplice sometimes. Yep, I have disaster written all over me. And that's why we don't have children. Chuck has his hands full. It's a full time job trying to raise me. On Sunday, I baked a cake. I decided to frost said cake. Sounds simple enough, right? Wrong. 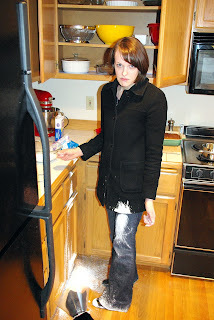 Why were you frosting a cake in a coat?